Are you a big hitter? Do you want a punch bag that will take anything you throw at it? 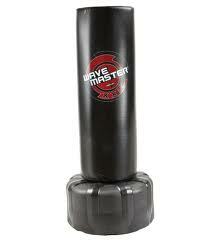 Because if you are the Century XXL Wavemaster is the punch bag you need. It has the biggest punching surface area of any bag on the market, meaning that it will take whatever punishment you give it. Mike Tyson could throw hooks into this bag and not make a dent. This is a freestanding punch bag, so it is great if the traditional banana bag is not an option for you. People with no place to hang a bag because of things like weak ceiling beams don’t have much in the way of options, so this equipment certainly solves that. A big plus is that it doesn’t need to be screwed down either, so it does have some, although limited, portability. The biggest plus of the Century XXL Wavemaster is the surface area. Not only can it take punches from Wladimir Klitschko but the surface mass means you can train for different sizes and heights of opponents without having to go through the rigmarole of adjusting its height. A lot of other free standing bags, like a lot of Everlast’s for example, need you to make adjustments as you work, and it can be tiring. This solves that problem. A tip for when you use the Century is not to fill the base with water, because that will cause it to slosh around and make it a little unstable. Fill the base with sand and you’re golden. It’s best as well to put the punch bag in a place with study floors. A garage or basement is ideal. If you want to get fit by doing an aggressive and fun cardio workout this will be ideal. If you’re a big guy and a heavy hitter, or if you’ve broken other bags by giving them a beating, the Wavemaster will do a job for you. The material is top quality vinyl over high density foam so it will take whatever you can throw about it, including punches, kicks or even a sledgehammer if you’ve got one handy. If you actually throw punches hard enough to do damage to this thing then I salute you, and I think you need to get yourself to a gym and get yourself a trainer. If you want a portable, durable, high quality punch bag that will give you a fun cardio workout then you should take a look at the Century XXL Wavemaster.